The ADAS market is estimated to surpass US$65bn by 2024, according to a new research report by Global Market Insights (GMI). 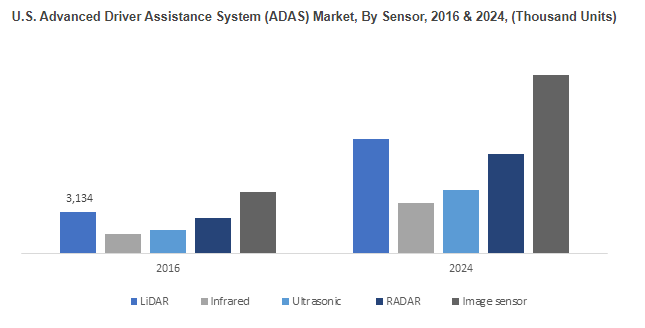 Research has shown that the market for image sensors used in ADAS is expected to grow, accounting for over 33% of revenue share over the next eight years. These sensors are installed in the majority of systems. The applications are rapidly growing across the globe, resulting in an increased demand for image sensors. The affordability of these sensors compared to their counterparts is another factor supporting their growth. The market for radar sensors will see the highest growth due to their extensive usage in AEB and adaptive cruise control systems. PCVs will dominate the ADAS market, accounting for over 65% volume share by the end of 2024. Rising road safety concerns have led to their increased installation in these vehicles. Moreover, a substantial rise in the sales of premium vehicles across the globe will further deepen product penetration. 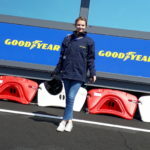 Regulations in developed regions across the globe including Europe and North America, which have mandated the installation of ADAS in vehicles, have caused an escalation in revenue generation. Park assist is likely to become a dominant technology in the ADAS market, with a volume share of over 16% through to 2024. These systems have become more prevalent in the industry over the past few years. The market share for forward collision warning will also grow rapidly in this timeframe. Several countries including Japan and China are witnessing a high demand for these systems, especially in compact cars, affecting the ADAS market positively. They are also increasingly being installed in premium and luxury vehicles. Manufacturers are continuously shifting their focus toward usage of image sensors due to their benefits such as high pixel quality. These benefits are likely to further increase the demand for several applications including surround view systems, autonomous park assist, and blind spot detection. However, excessive costs coupled with a rise in software failure incidences may hamper ADAS market growth over the forecasted timeframe. Continual technological advancement has resulted in a rise in customer demand for these systems. CMOS image sensors in particular have gained market share. These sensors comprise digitized, noise correction circuits and amplifiers that provide accurate rear view images. The sensors are also extremely efficient under extreme temperatures. The North American ADAS market is expected to grow to more than 34% over the next eight years. Increased testing of these technologies will primarily contribute to the high revenue generation. The market in Asia Pacific will grow rapidly, too, with a CAGR of over 14.5% from 2017 to 2024. 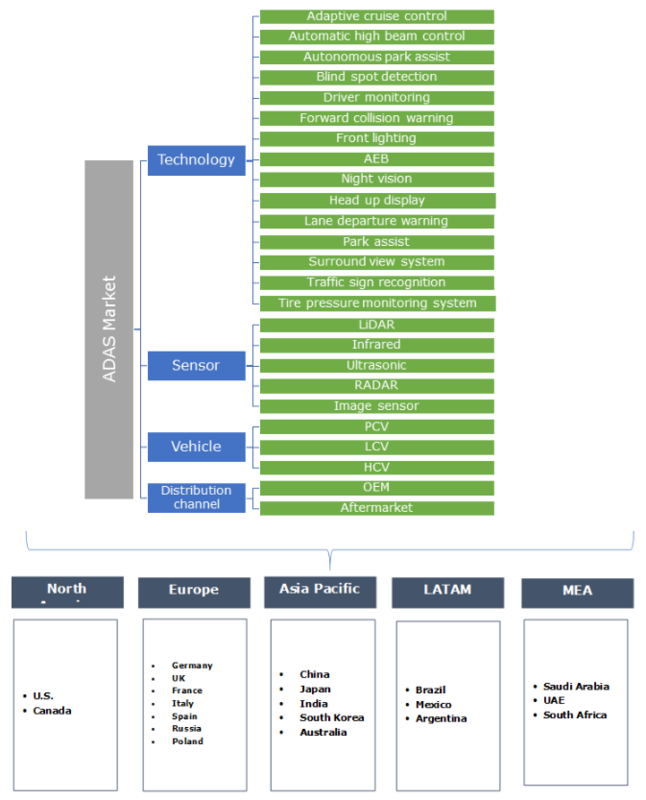 Denso, Delphi Automotive, Continental, Autoliv, Bosch, Harman, Mobileye, TRW Automotive, Nvidia Corporation and Hyundai Mobis are among the prominent players in the ADAS market. Many partnerships, mergers and acquisitions have been formed in recent years and this will continue.